Some weeks I just can't find the energy to cook a super fancy meal. In case you haven't noticed I still like to eat. This post is just a really simple meal using ingredients that you'll find aplenty in the late fall and early winter. Roasted Chicken Breast, Roasted Beets and Braised Greens. These greens happen to be Swiss Chard, but if you buy your beets with the greens still attached then you might as well use those. I'm a big fan of greens. It's really about cooking them correctly and not overcooking them. 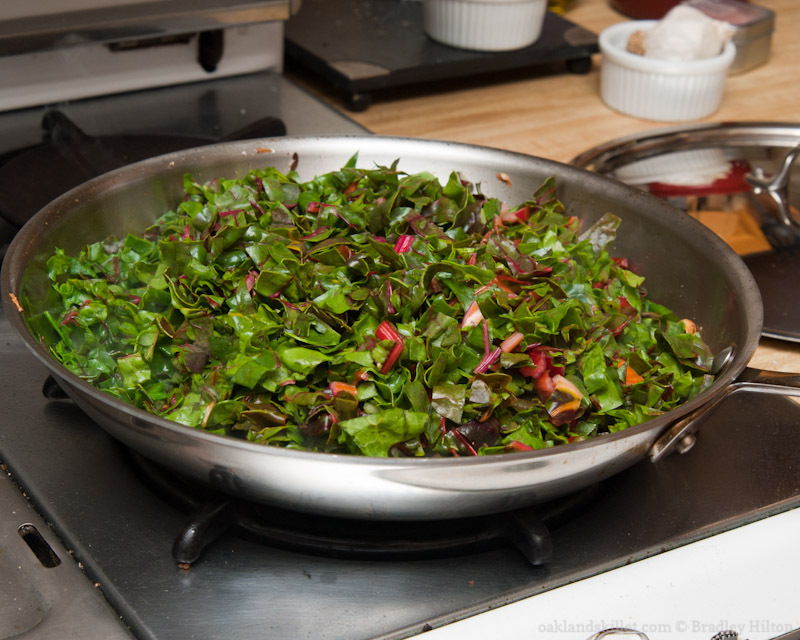 The softer greens will cook quite quickly, so make sure everything else is ready before you start them. 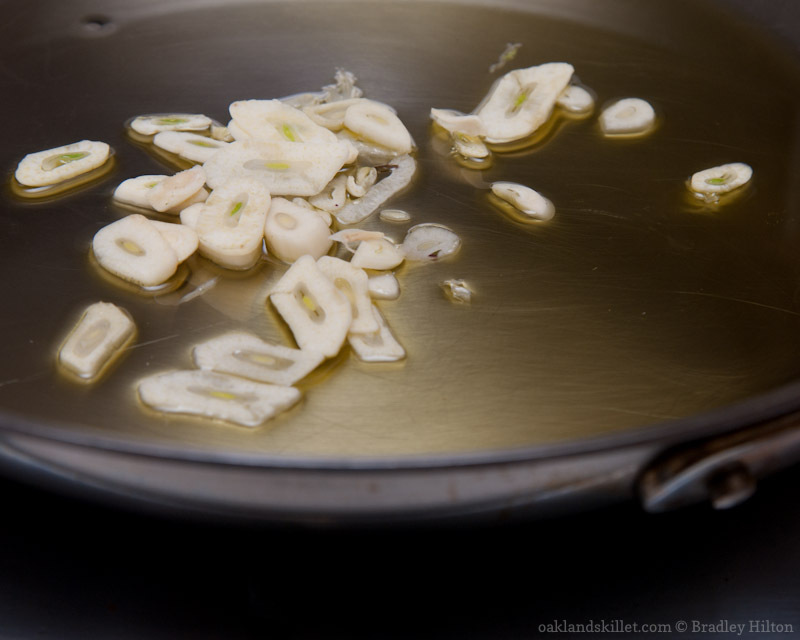 Add the oil and garlic to a large cold skillet. 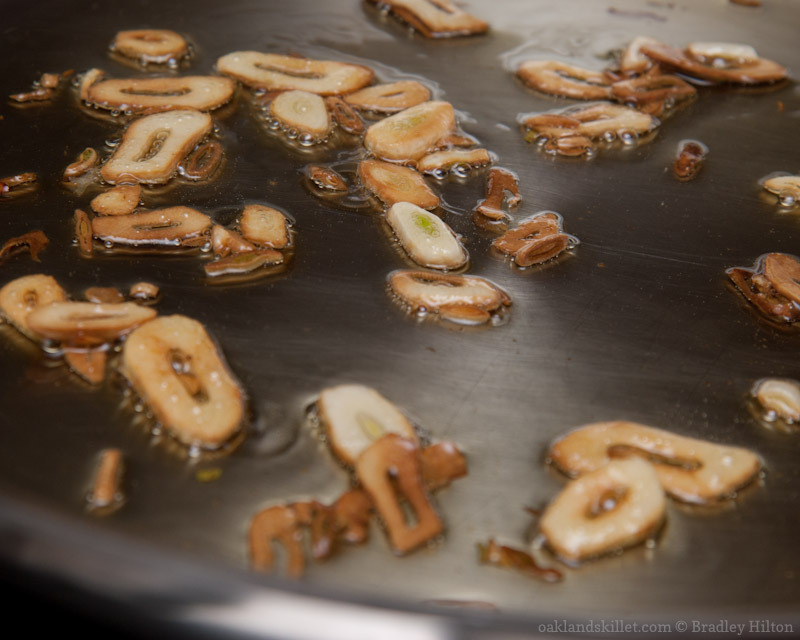 Place the cold skillet over medium heat and bring the pan to temperature with the oil and garlic in the pan. Saute the garlic for 8 - 10 minutes until it becomes a dark golden brown, but be careful not to burn the garlic. If the garlic begins to darken too quickly remove the pan from the heat. Sometimes I tilt the pan over the burner so the oil pools and the garlic is almost completely submerged in the oil. Move the garlic around so it doesn't burn. This is more important than not overcooking the greens. If you burn the garlic you have to start over or your greens will be poisonous (that's not true, but they will taste awful). 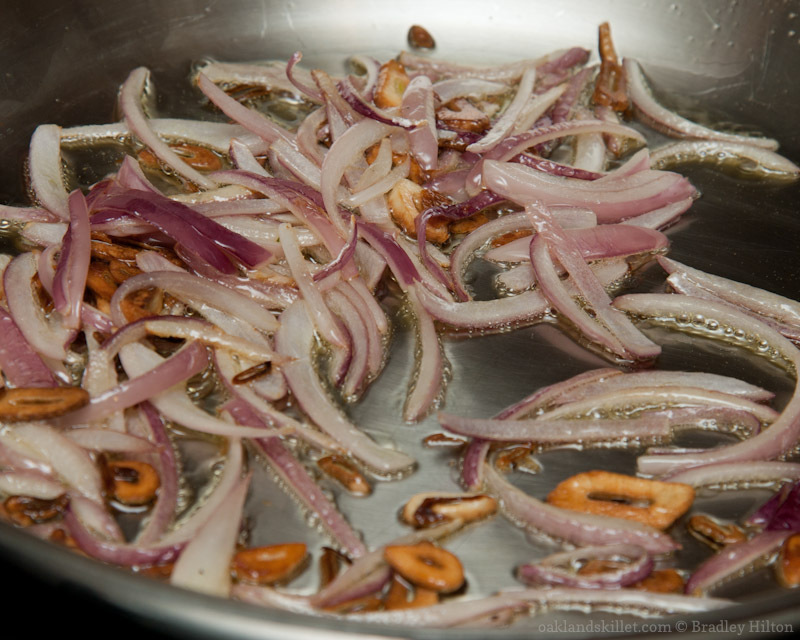 Bringing the oil and garlic up to temperature in a cold pan will bring out more of the garlic flavor. You'll get a toasted garlic flavor that really complements the bitterness of the greens. Add the shallots or onion and saute for 1 - 2 minutes more so the onion is softened. Add the greens and turn up the heat slightly. Toss them a few times so the oil coats them. Once the greens have started to cook down a bit add some of the wine. 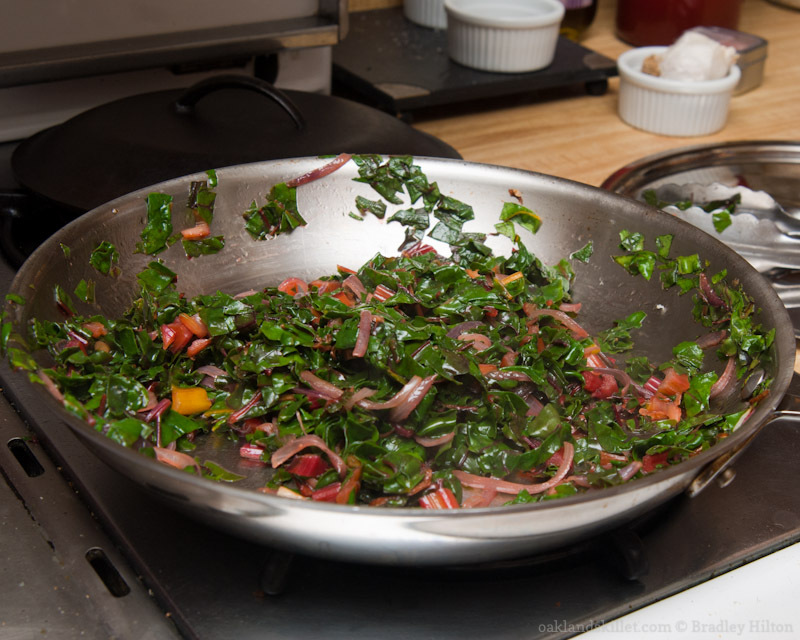 Toss the greens so they cook evenly. Add more wine if they seem like they are not wilting enough. Just before removing from the heat sprinkle the vinegar over the greens and toss. Remove the pan from the heat and serve immediately. Cut stem end and the thin little root tip off. Coat the beets with olive oil. Place in an oven proof dish spaced at least 1 inch apart. Cover with foil and bake covered for 1 - 1 1/2 hours depending on the size of the beets. A knife should easily cut through the beet when they are done. Remove the beets from the oven and allow them to cool a bit before pealing them. Cut the beets in whatever size chunks you want. Place back in the roasting dish and cover. You can use the oven to reheat them if necessary. While the beets are baking put the balsamic and sugar in small skillet or sauce pan over medium-low heat. Reduce by 1/2 - 2/3. This takes about 10 - 15 minutes. 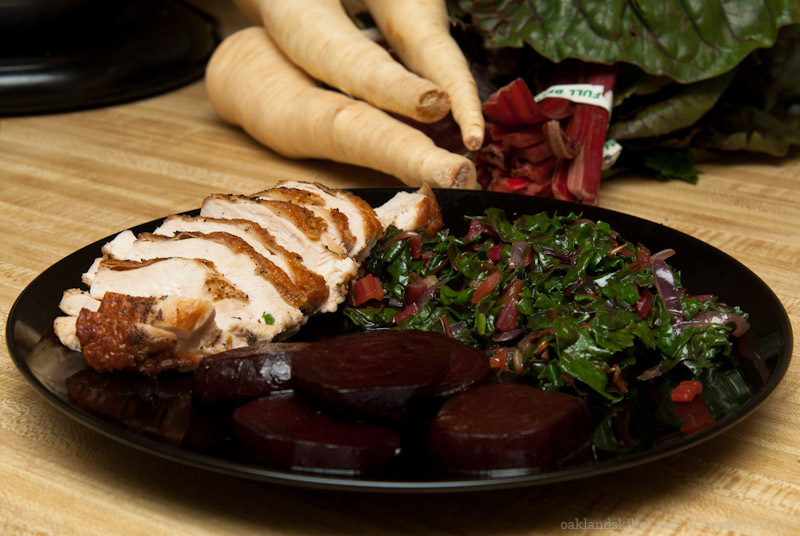 Pour the reduced vinegar over the beets before serving. Brining is recommended if you have time (see brining on the Basics page). And for the love of good food LEAVE THE SKIN ON while you cook your chicken breast. If you don't like to eat the chicken skin then take it off once it's on your plate. Cooking the chicken with skin on will help keep the chicken from drying out. Pat the chicken dry with a paper towel. Season both sides with salt and pepper and thyme. Heat a heavy ovenproof skillet over medium high heat. Place the chicken in the pan skin side down. Brown the chicken on the skin side for 5 - 6 minutes then turn the breasts over and continue browning for 3 - 4 minutes. Cover the skillet with a lid or foil and place in the oven for 20 - 30 minutes until the chicken reaches an internal temperature of 164º F. Remove the pan from the oven and leave the pan covered for 5 - 10 minutes. Slice the breast and serve. Notes: This is a simple and pretty quick meal. beets re-heat well, so you can make them in advance, but put the balsamic glaze on warm before you serve them. If you have time brine your chicken breasts 8 hours ahead of time. If you eat enough beets your urine will be a very disconcerting color, but it's worth it.